I know I’m a little late with this one because it would have been perfect for Thanksgiving, but it will still make a great choice for any Holiday party. After making the cranberry syrup, you’ll be left with a compote that can be used for all sorts of things! If you are making cocktails you definitely need some appetizers, so the compote will be great for that. 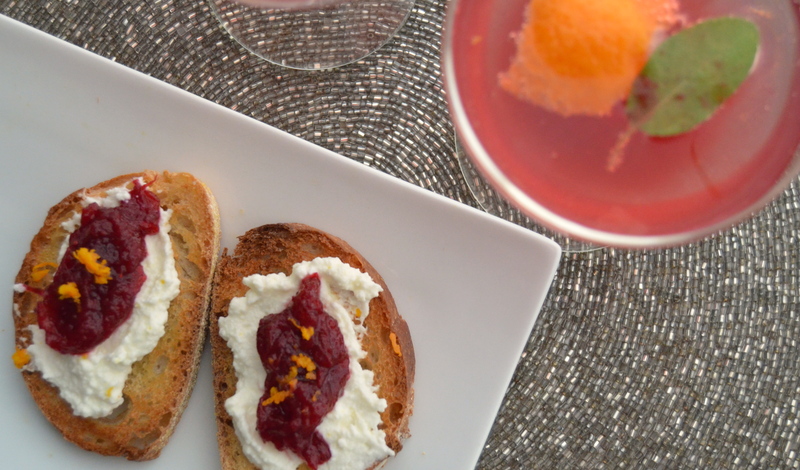 I toasted a few baguette slices and topped them with fresh ricotta and the cranberry compote. Feel free to drizzle with honey and add a little orange zest. I used ricotta because that’s what I had on hand at the moment but I imagine Brie or Délice de Bourgogne would be even better. Place all ingredients in a saucepan and bring to a boil. Reduce heat and simmer for about 10-15 minutes until mixture has thickened slightly. While mixture is simmering, mash cranberries using a potato masher to release their juices. Let mixture cool in pan for about 15 minutes. Strain using a sieve. DO NOT throw out the cranberries left once mixture is strained. Remove the cinnamon stick and vanilla bean. What is left is your cranberry compote! If you like things on the sweet side, add more sugar to the cranberry mixture starting with 1/4 cup at a time. For the cocktail you can also choose a sparkling wine with a little more sweetness to balance the tartness of the cranberry. To assemble to Cranberry Sparkler, pour spiced cranberry syrup into champagne glass. Top with champagne or sparkling wine and garnish with a nice size piece of orange peel and a sage leaf. Rub the sage leaf slightly before adding to the glass to release some of the oils. If you want to get really fancy you can flame the orange peel before adding it also. Previous Post Tune in this Saturday!